These days I don't get over to Chapel Street as much as I used to, sadly (or not) the days of partying at Revolver until the wee hours are well and truly behind me. On this occasion I was quite excited to be invited over to the Windsor end of Chapel to check out the not so subtly named 'The Thai on Chapel'. Life has been pretty busy lately so I wasn't able to do much research about what to expect, as is my usual process. With so many great food blogs and Urbanspoon at my disposal it's actually quite rare these days that I don't walk into a restaurant without pretty much knowing exactly what I am going to order before a menu is even placed in front of me. After my excellent experience at 'The Thai on Chapel' I'm starting to question whether taking away the element of surprise actually somewhat diminishes a little part of the dining experience. On walking in to the restaurant I was immediately aware of the differences to what I usually encounter when entering the Thai establishments that I normally frequent. The interior is quite dark and warm and rather modern yet rustic in appearance and feel. I really think the restaurant design thing is harder to do well than it might seem. In this aspect (and most others) I would say the folks at 'The Thai on Chapel' have done really well. Even better, and perhaps my favourite thing about 'The Thai on Chapel' is the open (and very clean looking) kitchen where you can watch the chefs making Kanom Krok and Kao Kiab Pak Moo. Comparisons to the legendary Sydney 'Chat Thai' immediately came to mind. On grabbing ourselves a table and a menu I immediately noticed the 'Appetizer' section which contained a list of most of my favourite dishes and I started to worry as I often do when accepting these invitations that the dishes that the proprietors would select for us may not be the same as those I would have selected for myself. I needn't have worried. 'The Thai on Chapel' have a definite focus on Street Food and thankfully this is what they decided to showcase to me on my visit. 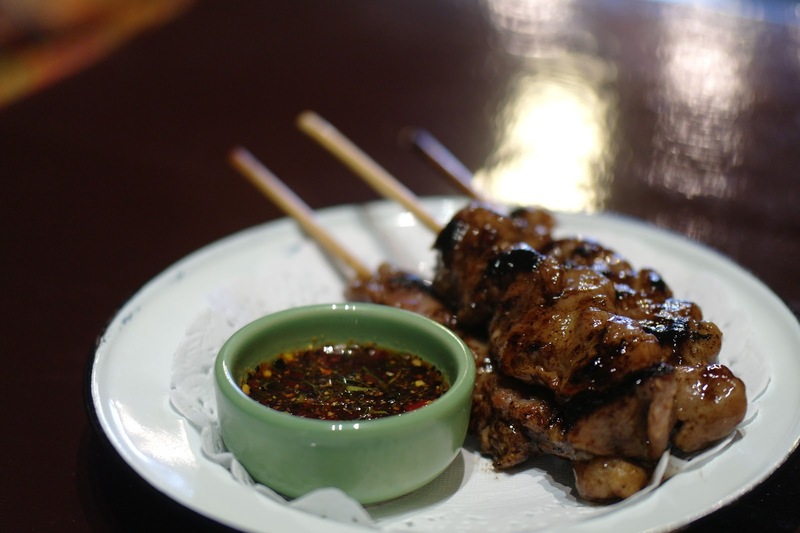 First up was the always delicious Moo Ping (Grilled Pork Skewers), I love these little guys with their smoky sweet flavour and amazingly zingy Jim Jaew dipping sauce accompaniment. Forget Satay, it's Moo Ping all the way for me! 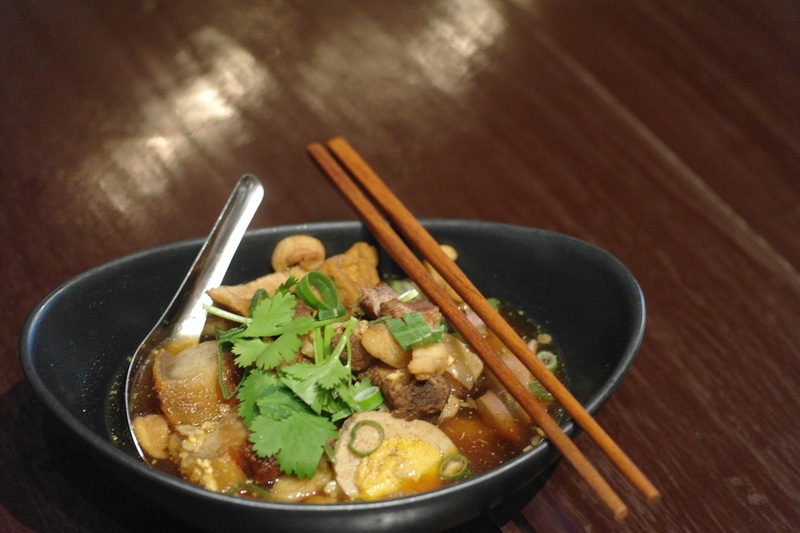 Here is a great recipe for Jim Jaew from the supremely authoritative She Simmers. I just can't wait for her soon to be released cookbook! 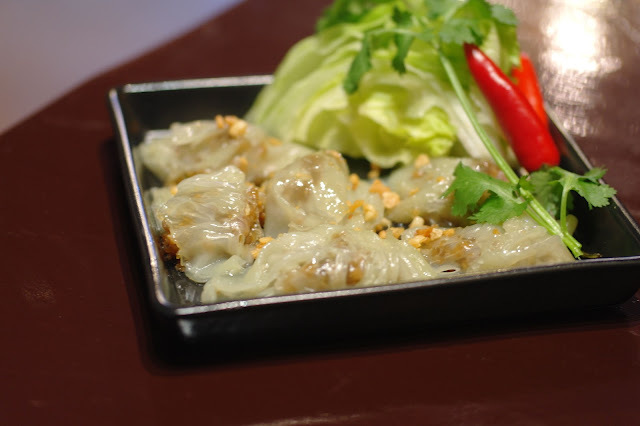 Another dish you can observe being made is the deliciously nutty and sweet Kao Kiab Pak Moo (Steamed Pork Dumplings). These consist of a nutty tasting pork and pickled turnip filling wrapped in a delicately steamed rice paper. These gorgeous little dumplings were a new one for me and one that I will definitely be returning to enjoy again. The filling tasted very similar to another favourite Thai street food snack Sago Sai Moo. 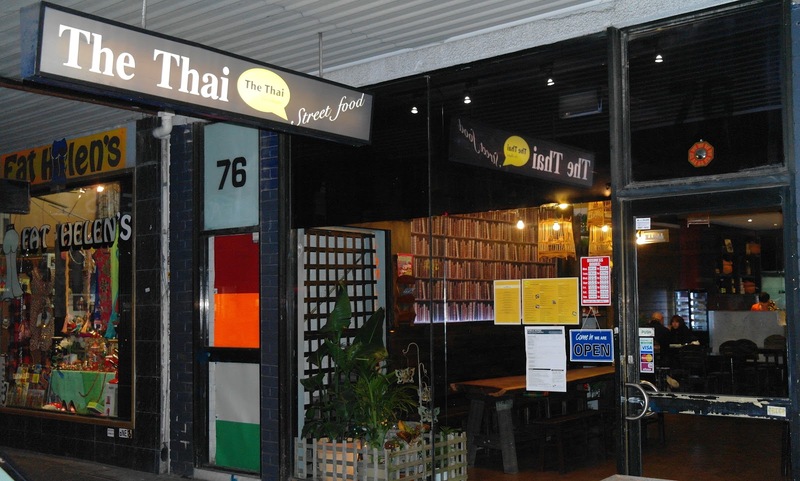 I have eaten the next dish at a number of Thai establishments both in Thailand and Australia and the beautifully constructed 'The Thai on Chapel' version is up there with the best. 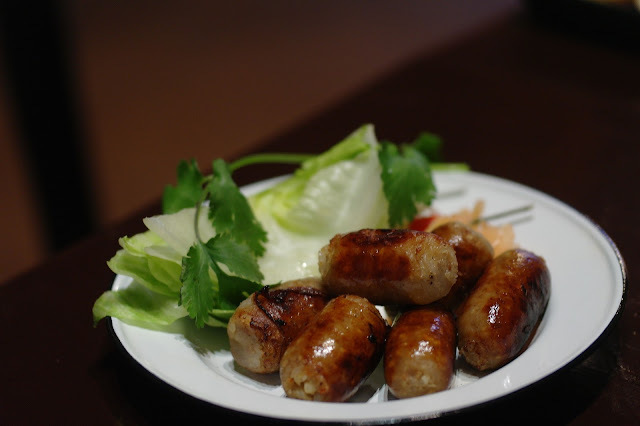 Often Sai Krok Issan (Fermented Pork Sausages) can be extremely powerful on the garlic, which is fine at the time of eating but can be difficult for those you come in contact with for the next 12 hours but these had the balance just right. Not too powerful on the garlic but just enough to enjoy the spicy funky blend of fermented pork, garlic and sticky rice. 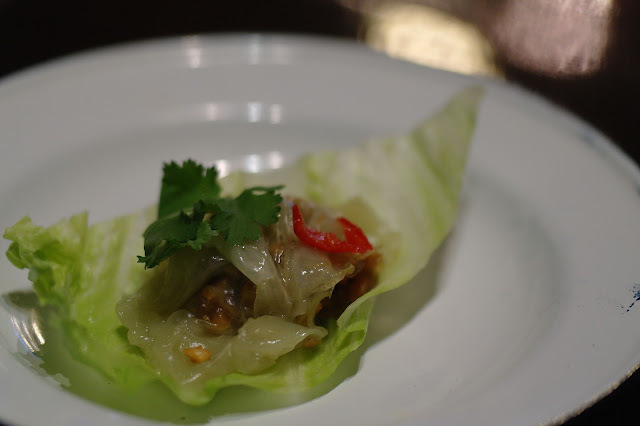 They are eaten wrapped in a crunchy lettuce leaf with a price of spicy ginger and a slice or two of chilli. Perhaps an acquired taste for some but for me these are the kinds of flavours that remind me of so many wonderful meals that I have enjoyed in Thailand. If there was only one reason to visit 'The Thai on Chapel' (and there are many) it would have to be the Kanom Krok. These amazing little morsels of sweet coconut goodness are another of the hidden gems of Thai Street Food. Apart from perhaps one or two other restaurants, I don't know of anywhere else in Melbourne that serves them and definitely none that do them as well as 'The Thai on Chapel'. Due to their lack of availability and supreme deliciousness I have previously been forced to make them myself. You can check out my recipe here, it's actually one of my most viewed posts. 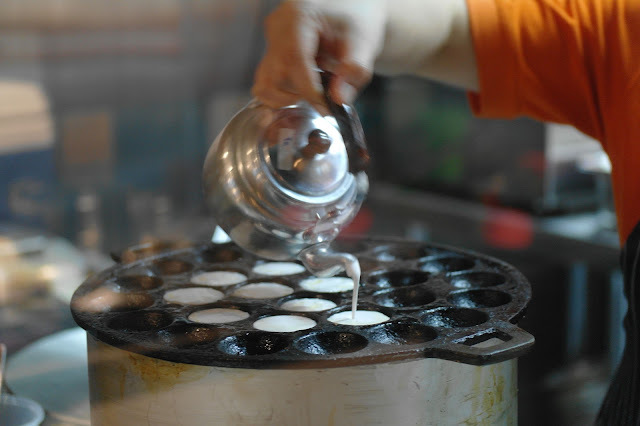 Kanom Krok are fried in a specially designed pan (see photo above) to achieve a crunchy texture on the bottom that combines perfectly with the sweet creamy coconut filling. The toppings are usually corn or spring onion which are delicious but 'The Thai on Chapel' version with sesame and peanuts was another new one for me and in my opinion one that definitely works. These are listed on the Appetizer section of the menu and are eaten throughout the day in Thailand however for most western palates they would possibly be more appropriately ordered as a dessert. Once we had happily devoured all the lovely street food snacks our hosts brought out a bowl of 'Guay Jub'. As I've said many times before, when done well Thai noodles soups are absolute masterpieces. It would be hard to find many other dishes with such depth and complexity of flavours. 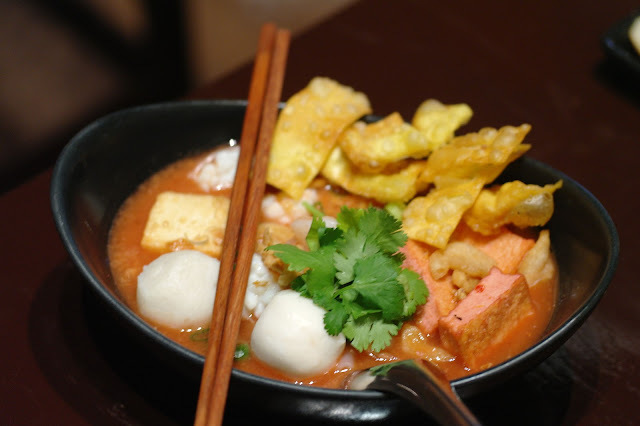 'The Thai on Chapel' Guay Jub is made from scratch and contains numerous ingredients, soft gelatinous fatty pork belly, braised pork, fried tofu, pork liver, pork crisps and a soft boiled egg. The broth is divine with a richness of anise, salty soy and sweetness that has you spooning mouthful after mouthful of the very special liquid. My Thai dining companion commented that this was the most authentic flavoured Guay Jub he has tasted in Australia (and we've had a few together). Yen Ta Four is the Chinese influenced (actually all noodle soups are Chinese influenced) Thai seafood variation of noodle soup. This broth is again made from scratch and in this case it is particularly noticeable as the flavour is quite strong and not something I can even go close to describing. For me the highlights of this dish are the springy fish balls, tender squid, crunchy wontons and of course the complex yet unusual flavoured broth. Yen Ta Four is another dish that isn't very commonly found in Australian Thai restaurants however I highly recommend giving it a try. It's definitely in the acquired taste basket but it does have an addictive sweetness that makes the discovery process a little less challenging. I was pretty much stuffed by this stage but our lovely hosts obviously knew my weak spot and made me an offer I couldn't refuse, a plate of Durian Sticky Rice. This is one of those desserts that I just can't say no to. If you have never tried it then get down to 'The Thai on Chapel' immediately. The flavour of durian is just wonderful and to me it is the smell of Thailand. I'm not sure how it happens but when I'm in Thailand it seems like the smell of durian is perpetually floating in the air. 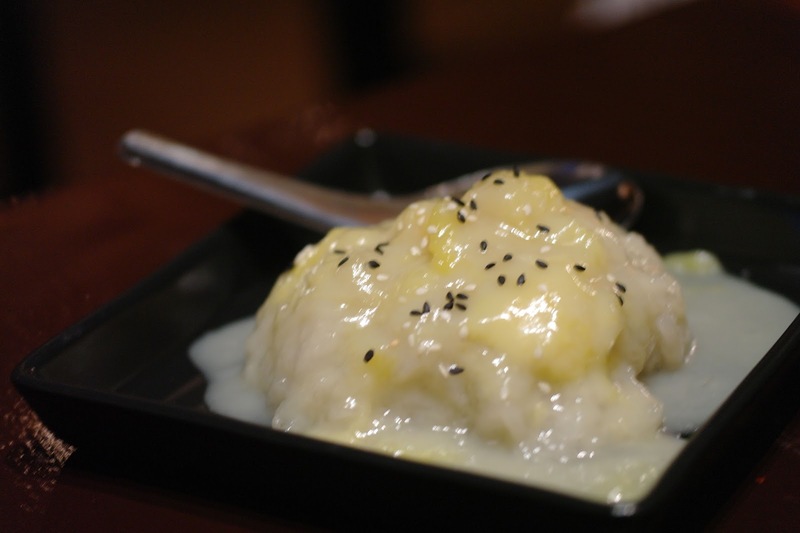 The funky earthiness of the durian combined with the sweet coconut cream and mushy glutinous rice is something to behold. 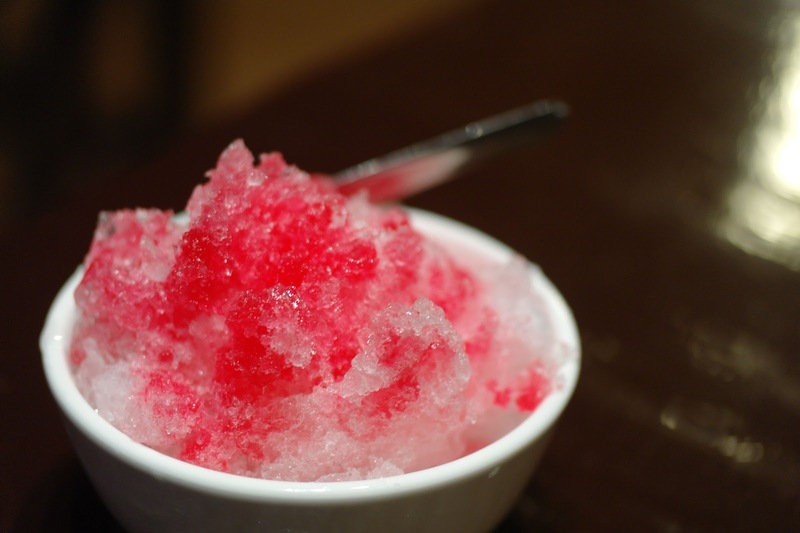 Tub Tim Krob is another classic Thai dessert. It's pretty simple in construction, you just colour some water chestnuts with red food colouring then toss them in tapioca flour and boil them until the red colour comes through, then add the red rubies to some crushed ice and sweeten it with a few squirts of Hale's Blue Boy Sala (Red) cordial. Simple, light and deliciously refreshing. 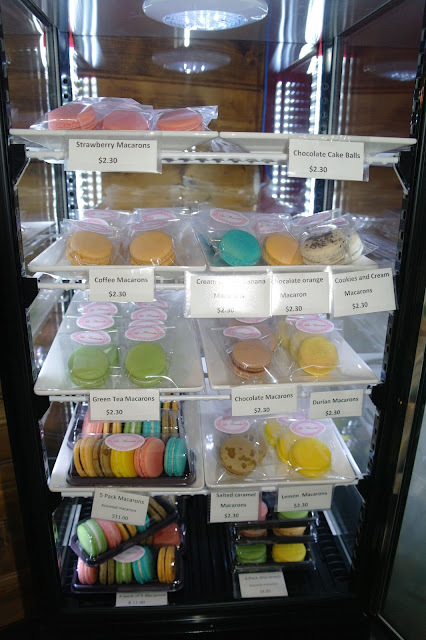 I couldn't help spot this conspicuous little display case filled with beautiful looking Macarons with flavours like Cream Cheese Banana, Chocolate Orange, Cookies and Cream, Salted Caramel and Durian! Sadly I didn't get to try any of them that night but I will definitely be looking for an excuse to drop by again and grab a box or two. Overall I have to say that I really enjoyed my meal at 'The Thai on Chapel'. Even more exciting is the many other items on the menu that sounded fantastic that I didn't get the chance to to try that night. Other dishes on my hit list are Patongko (Thai Donuts with Pandan Custard), Pad Prik Khing, Noodle Tom Yum and the Gai Yang to name just a few. I really like what the owners of 'The Thai on Chapel' have achieved with this restaurant. 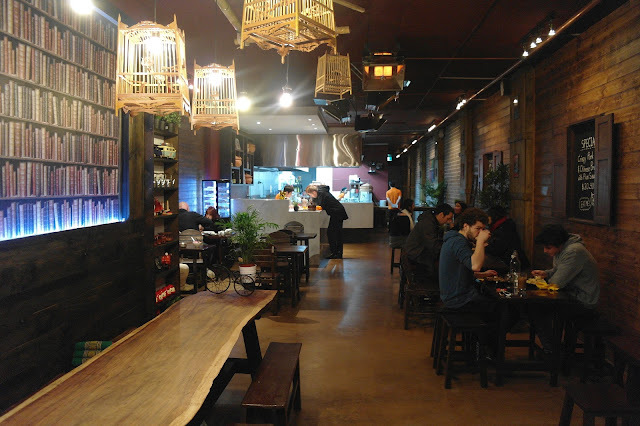 They fill that nice spot in between the high end Thai establishments like Longrain and the more cafe/eatery style places like Tidlom or iSpicy, all while maintaining a high degree of authenticity. I really think there is a big market for authentic Thai food served in a modern environment while not being too expensive. It might seem like I'm asking for a lot but the proprietors of "The Thai on Chapel' have shown that it's possible. I'm very sure that if they were located in the CBD they would be attracting queues not unlike those you will experience if you ever try and get a table at Sydney's Chat Thai. Thanks Peach, I'll look forward to your post! 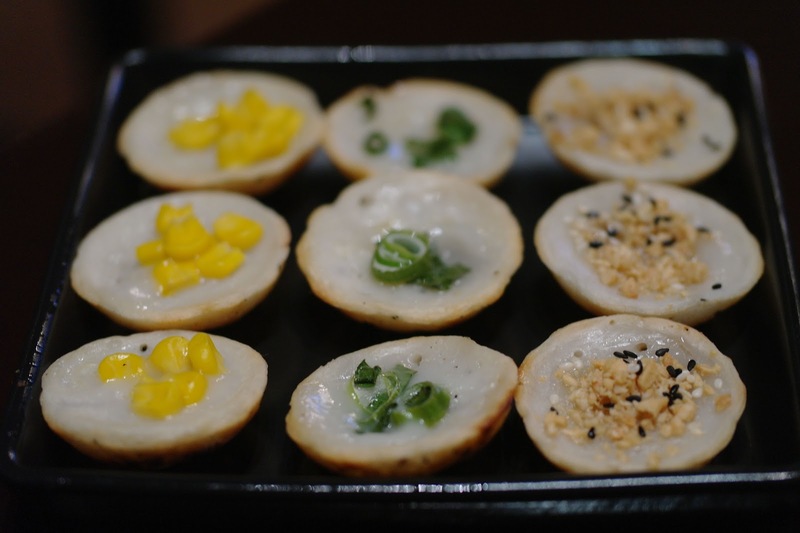 Definitely make sure you try the Kanom Krok, they were my favourite. Hi Winston, thankyou very much! I'm glad you stumbled onto my blog too. I really enjoyed my dinner at The Thai on Chapel and went back again on the weekend and enjoyed that experience even more.